With the WNBA All-Star game approaching and voting in its final days – fans have until Thursday to vote – Lynx coach Cheryl Reeve put in a plug for her players after practice Monday. A whole bunch of her players. The All-Star players will be chosen by a combination of voting from players and coaches, fans and a media panel. 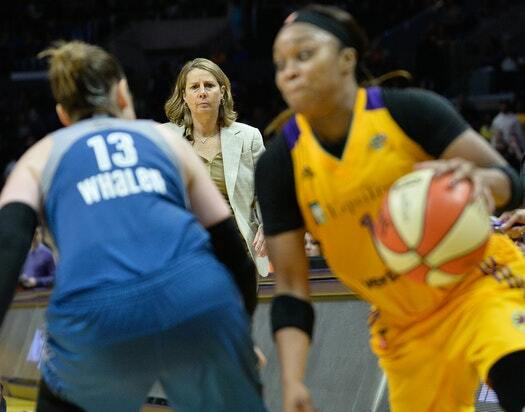 The early fan voting returns had Lynx star Maya Moore with the most votes and center Sylvia Fowles eighth. But Reeve would like fans – especially local fans – to vote as many Lynx on to the teams as possible. Like, maybe, the whole starting five? The All-Star Game is July 28 at Target Center. Washington Mystics coach Mike Thibault just became the first WNBA head coach with 300 victories. Whalen played a big role in that success. She was with Thibault in Connecticut from 2004 through the 2009 season, when Thibeault won 125 of those 300 games. Whalen, of course, grew very close to the Thibault family during her time there, as evidenced by her hiring of his daughter, Carly Thibault-Dudonis to be her assistant and recruiting coordinator at the University of Minnesota.